I can well remember the first time I read Mad Magazine. I was probably around Bart Simpson’s age, but nowhere near his degree of wiseass-ness. I found the humor of the adult world mostly mystifying and also pretty tame, given my rather sheltered existence. It was my discovery of Mad—stacks and stacks of old Mads, to be precise, in the rec room of a family acquaintance—that cracked the shell, one of those formative loss-of-innocence moments that are ultimately edifying. At the time, I couldn’t tell sophisticated satire from puerile parody, and the average issue of Mad was no Gulliver’s Travels. Nonetheless, its gleeful skewering of the American civil religion of politics, celebrity, professional sports, commerce, and middle class comfort hooked me instantly, and taught me about the value of freethought before I’d ever heard the name Jonathan Swift. 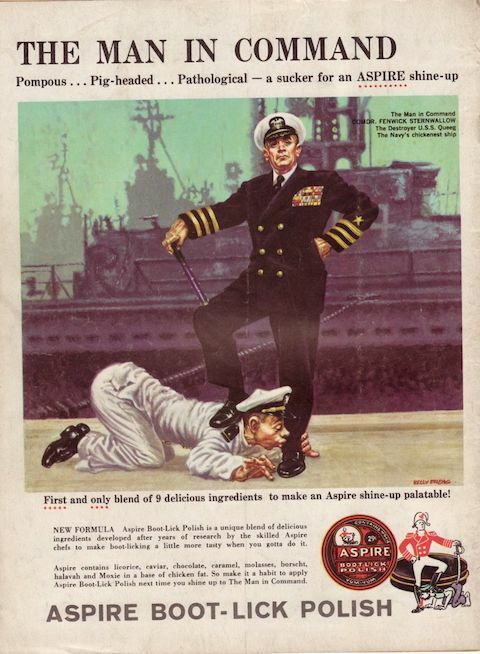 In the 1960 spoof ad above, military culture gets a send-up with “Aspire Boot-Lick Polish,” made for “The Man in Command: Pompous… Pig-headed… Pathological.” The flavored boot polish—“licorice, caviar, chocolate, caramel, molasses, borscht, halavah, and Moxie in a base of chicken fat”—is said to make “boot-licking a little more tasty when you gotta do it.” A clever inset links the U.S. chain of command with previous empires, showing a cartoon European naval officer of centuries past getting his boots licked by a subordinate sailor. 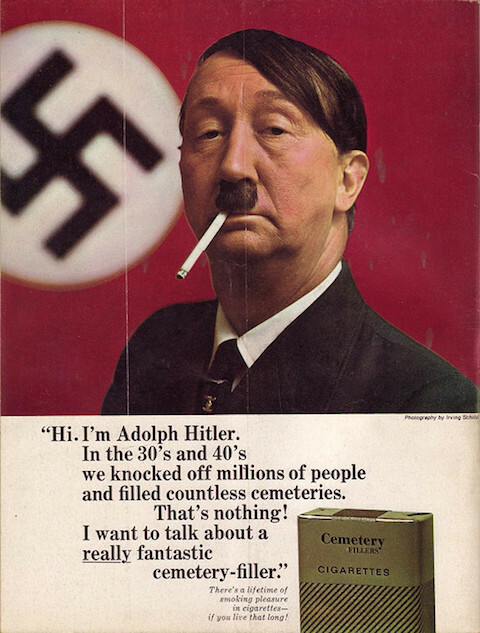 While cigarette companies were a frequent target of Mad’s fake ads, just as often they took on the inanity of the entire ad industry itself, as in the above 1965 meta-ad for “Let’s Kill Off Ridiculous Ad Campaigns.” The text reads, “If you advertisers have to blow your own horns, why tie your products to unrelated activities? 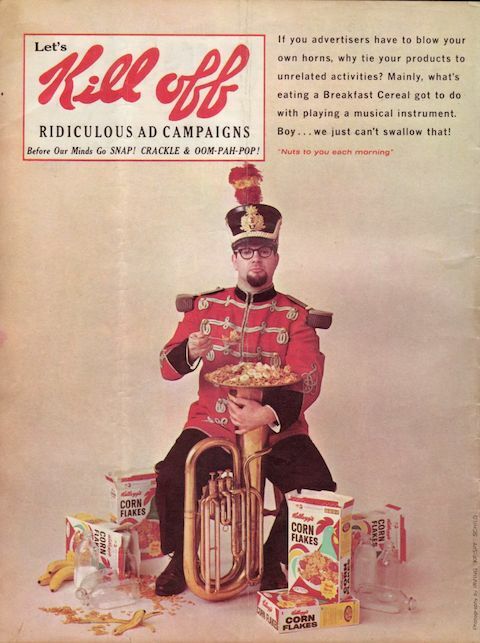 Mainly, what’s eating a Breakfast Cereal got to do with playing a musical instrument? 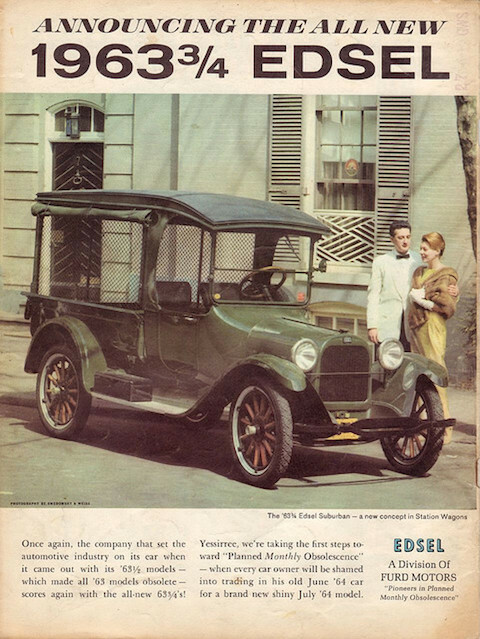 Boy… we just can’t swallow that!” Another regular feature was “Mad’s Great Moments in Advertising,” a kind of highlight blooper reel of ads gone wrong. 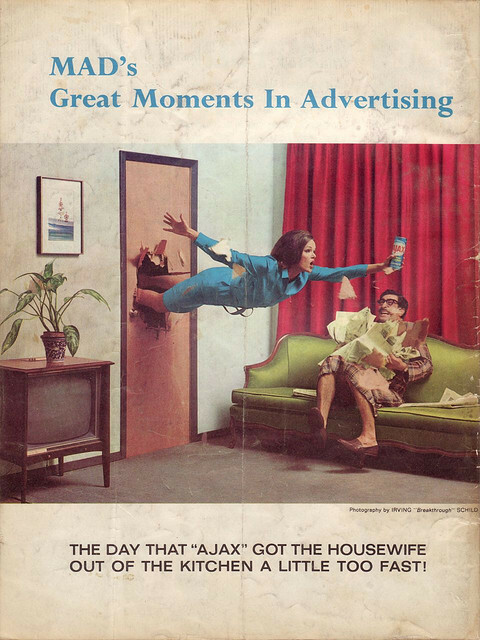 The example below, also from 1965, spoofs the promises of cleaning product ads to make the lives of housewives easier with a product that works just a little too well.